Sorry to hear that Kristy. Fires are so devastating and a lot of them happen this time of year for some weird reason. Glad everyone made it out okay! Work wasn't too bad Katy. Worked this past night too Now off for three nights back for two. I hope it warms up a bit in the next couple of days, I really have to get the yard mowed and the Dog Run cleaned. Been so horribly rainey October I didn't get out there once so now it's a muddy mess again. Every day I didn't work rained like a monsoon. Need to start Christmas shopping but I hate to even think about it before December. But I guess it must be done. I don't buy for too many people as I just haven't had the extra money the past few years. I prefer to make gifts but that too didn't happen this year cause we were low on funds and wasn't able to purchase yarn for new projects. Oh well, it'll all work out in the end. Have a good day all! Off to finish up work here then home to take Little Tribble to school and a nap later. Been in the 20s here the last couple of days. I HATE cold weather... If I didn't have to leave the house, it would be perfectly fine. But I do so I want it at least warm enough that I don't have to wear shoes or a coat. Bah. Going to work more on my ugly blanket soon. I came across some more yarn I have that won't be used. Other than that, crocheted a couple of eyeball bookmarks, eyeball bracelet and zombie fingers for Halloween. All from scrap yarn. We have a Kmart about 20 min from us that is going out of business. Went and got a few things. Some egg and bacon pj pants, and two pairs of work pants. Been putting off buying work pants but since the were 25% off I decided to get a couple. Little Tribble got a pair of Snowman socks and a remote control police truck. Mr Tribble got pj pants and a wooden cane he's been wanting. He's still using one for steadiness since the knee replacement on Oct 9th. His therapy is going good. only has 20 degrees more to go before he will be able to bend it to where they want it. He's can bend it further now than before he had the replacement. Have a good night all, Im going to be awake all night at work! LOL... Bad when Im ready for a nap already. Just checking in... I am reading the posts just not had time to respond... have a wonderful day all!! Girls if you look at these pictures they will help you go to your first unread posts in a thread. Go to My activity Streams then Content I follow. There is a little star next to the name of the thread and if you click that star, it will take you to the first unread post. Hope it helps! I discovered this by accident. Sooo much fun to paint rocks. I love all the Star Treks. My favorite is The Original Series, least favorite is Deep Space 9. The movies of course are great as well, my favorites being The Voyage Home and The Undiscovered Country. I have watched them SOOOOO many times! I fell in love with Star Trek when I was an early teenager We didn't have a TV so I began my Star Trek experience reading the Book series. This was the 90s. Always been a Trekkie. Always will be. I love all sci fi. My favorites including Dr Who, Taken Miniseries by Steven Spielberg, Galaxy Quest, Evolution, All of the Alien movies, Species, Predator. Etc. My weekend to work so working. I think the Halloween Parade is Tuesday which I have to work, but trick or treating is Thursday so Little Tribble is getting pretty excited. We havn't done anything much for Halloween so far since Mr Tribbles Knee Replacement was the 9th. Hopefully next year we will be able to go do more! Bout time to have Little Tribble watch Scared Stupid and Nightmare before Christmas with me!! LOL, he wasn't impressed last year with Rocky Horror - a bit too young still. Have a great night all Talk to everyone later. Yes, we are loving The Orville - it's fantastic! I love the gelatinous crew member too, hilarious! I understand not feeling like doing things when things like this happens. Little Tribble was celebrating his kittys birthday yesterday. We rescued him, he wouldn't have made it had we not taken him in. Didn't know his birthday so Braxton said he wanted his birthday to be on Halloween. We said okay. About a week ago, he decided to change the date to the 20th (birthday party a day early he said)! LOL. He even made us sing happy birthday to his kitty. Little Tribble is going as Cursed Puss in Boots. Cursed Boots is black instead of Ginger (according to Little Tribble) LOL... We've got all the pieces for his outfit now just have to put together. Hope kitty gets better! Ive been doing a bit of artime. Just a little bit of crochet. 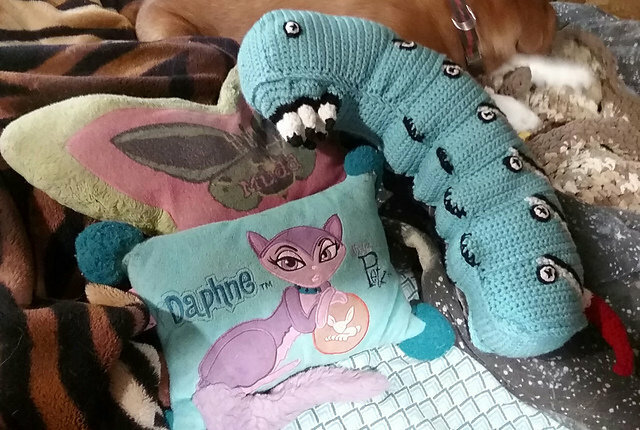 I started a scrap blanket and think I'm going to try and finish my huge horn worm I started a while ago... worried I will run out of green yarn. After that I have a pattern for a slug and a nudibanche to make... 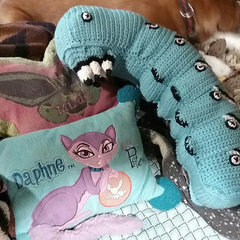 I love slugs so am antsy to get the caterpillar finished! 😊 Weathers been cool here in the mornings and warm of the evening... lovely weather. Hubby's knee replacement went well and he's walking now with a cane. 28 staples come out next week. Have a good evening all!!! Just a quick check in to let everyone know I am still here. Been so busy lately havn't had a chance to be on much. Hang in there Owlvamp ,sending positive vibes your way! quick check in... Was sorry to hear about the loses. Have a good night all!! quick check in.... Hope everyone is doing good!